There's a new spot on Michigan Avenue to get lost in electronics heaven -- or to spend your lunch money. 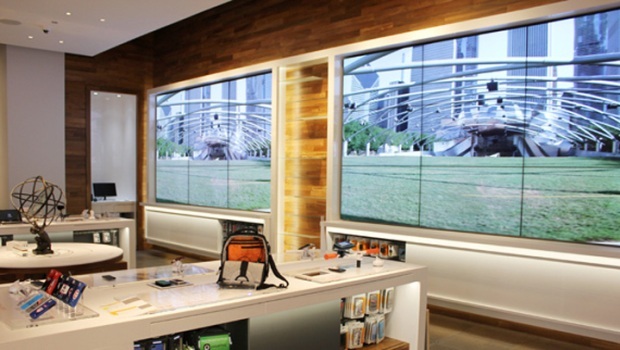 AT&T unveils a new 10,000 square-foot flagship store on Sept. 1 in the old Ann Taylor space at 600 North Michigan Avenue. Company officials say the store will offer the products and services you'll find at your typical AT&T retail store, but it'll also be a destination to get a glimpse of future technologies like connected cars that use wireless technology to aid driving. Expect visual overload with 100 digital screens spread throughout the store. 10,000 square-foot space offers retailer's latest products. The Explorer Lounge is home to the Apps Bar, which showcases the company's latest apps with "app-tenders" on hand to provide one-on-one and group instruction. The Lifestyle Boutiques offers ways to incorporate apps into your own life with an emphasis on Chicago-themed apps and accessories. The Experience Platform is the place for the connected home, with products geared toward home security and automation, music, entertainment and automobiles. The Gallery features smartphone cases designed by Chicago artists Cody Hudson and Dalek. The store will be open 10 a.m.-8 p.m. Monday thorugh Saturday and 11 a.m.-6 p.m. on Sundays.